Editor’s Note: This is the inaugural blog post from Brent Suter, starting pitcher for the Milwaukee Brewers and Outrider’s Sports Ambassador for the Environment. A Major League Baseball clubhouse probably isn’t the first place you’d think that environmental debate happens but trust me, at least with the Brewers, it goes down! While we don’t always come to a consensus on the issue of climate change, I’ve found I’ve had some success by talking to my teammates about why this is an important issue to discuss, and through leading by example. I share the Outrider Foundation’s philosophy that as good stewards of the environment, it’s important that we do more than preach to the choir. To make any significant progress, we also need to increase the size of our congregation. Sports is a great way to reach new audience members, and that’s one reason I’m so excited to team up with Outrider to expand our collective voice. But more important than tactics, I share Outrider’s mission – preserving the long-term viability of our planet for future generations. I’m pleased to join the group as a sports ambassador, and you’ll be hearing from me throughout 2019 as we collaborate on a host of environmental initiatives. Professional athletes have a unique platform to help drive this conversation, and I plan to use mine both as a role model for kids and an example for adults. 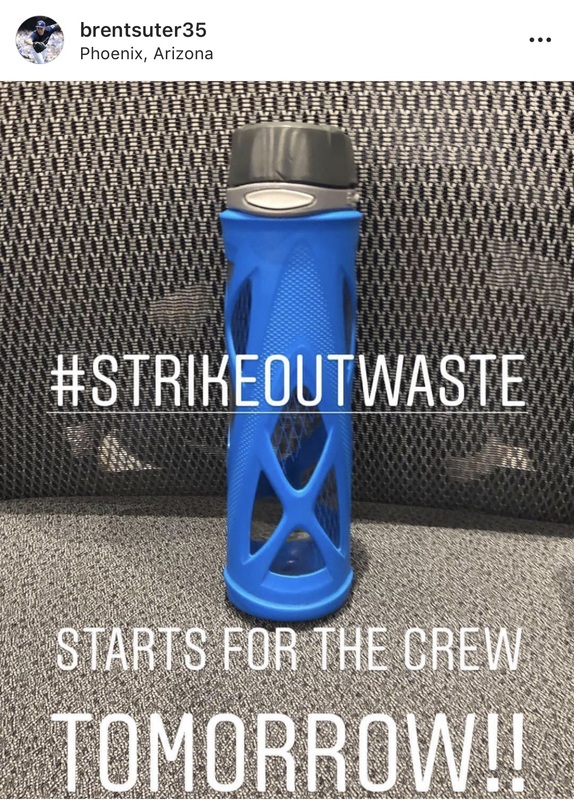 I recently launched a “Strikeout Waste Campaign,”encouraging fans to use reusable bottles instead of single-use plastic bottles or paper cup. You can follow those efforts on Twitter at #StrikeoutWaste, and at my handle, @bruter24, where you’ll see my teammates joining me in this campaign. And I’ll be looking to have an impact in the Brewers dugout too – it’s not a great image for our sport to have paper cups and plastic bottles littered on the dugout floor. I’ve had many spirited conversations with my teammates on climate change, and the debates are always respectful. However, I’ve found that having a doomsday approach turns guys off. It’s better to take a hopeful tone and urge my teammates to think about helping build a brighter future for their kids and grandkids. Also, like in any situation, I find it effective to communicate by action and not just words. In my case, that means taking shorter showers, using reusable Tupperware and water bottles, composting everything I can, planting milkweed and trees, using reusable grocery bags, and putting solar panels on our house in Cincinnati. It also means making healthy and environmentally friendly changes to my diet – cutting out beef entirely, trying to eat vegan one or two meals a day, and making frequent visits to my favorite vegan restaurant near my home. Fresh fruits, vegetables, and whole grains are so delicious, healthy, and planet-friendly! When I do eat meat, I try to make sure it’s organic and locally sourced. There are other guys on the ball club who share my passion, such as Ryan Braun and our manager, Craig Counsell, as well as passionate organizations I’ve been involved with such as Players for the Planet – which I was pleased to recently join – the Urban Ecology Center in Milwaukee, Eco-City Milwaukee, and the Green Sports Alliance. Concern for the environment came naturally to me, even before I had heard of climate change. I’ve always loved the plants and animals that we are blessed to share the planet with. But it wasn’t until I saw Al Gore’s “An Inconvenient Truth” in high school that my eyes were open to the danger that global warming poses. I went on to get a college degree in Environmental Science and Public Policy. Gore has been an environmental inspiration to me, as have the many scientists, activists, innovators, and politicians pushing for a green revolution! I’ve also been impressed with Republican Arnold Schwarzenegger’s leadership on this effort. As someone who was raised Catholic, my faith is also a huge basis of why I’m environmentally active. God gave us this beautiful world, and it’s our job to take care of it. Recently, combatting climate change became more personal for me, following the birth of our son Liam last October. I want him to have a hopeful future with a beautiful Earth, and I want to do everything I can to make sure he has it. In recent years, more professional and college sports teams are adopting the “green sports” philosophy, recognizing the contribution that stadiums and arenas can make through steps such as using renewable energy, reducing the waste stream through recycling and reuse, and offering more vegetarian food to fans. The green sports movement is also about athletes lending their voices to the cause, and I’m excited about amplifying my message by collaborating with the Outrider Foundation. And I’ll keep trying to win over my teammates.